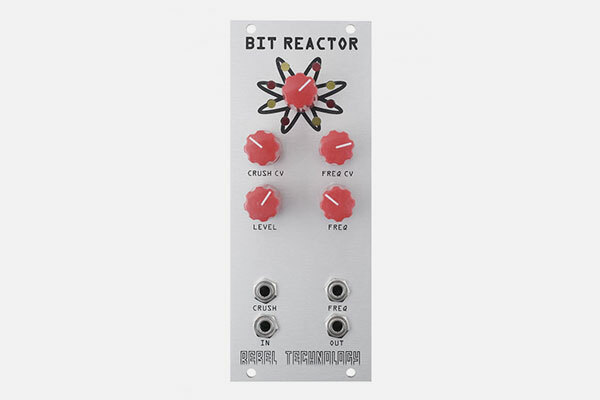 The Bit Reactor is a hardware bit crusher and downsampler. It has no program or CPU, it digitises without software. It takes whatever signal you give it and crunches it up into digital atoms. There are two main parameters to play around with on the Bit Reactor: bit depth and sampling frequency. Less bits means the signal levels can’t be properly reproduced, and this can result in anything from a fairly subtle to a super-clipped square wave distortion and its associated harmonics. Meanwhile the sampling frequency determines the maximum frequency that can be accurately reproduced. Note: requires +5v power rail!